Democratic Party (N.C.). 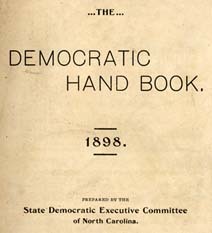 State Executive Committee The Democratic Hand Book. 1898. Prepared by the State Democratic Executive Committee of North Carolina. The Democratic Hand Book. 1898. Prepared by the State Democratic Executive Committee of North Carolina. Raleigh: Edwards & Broughton, 1898. African Americans in the civil service -- North Carolina.